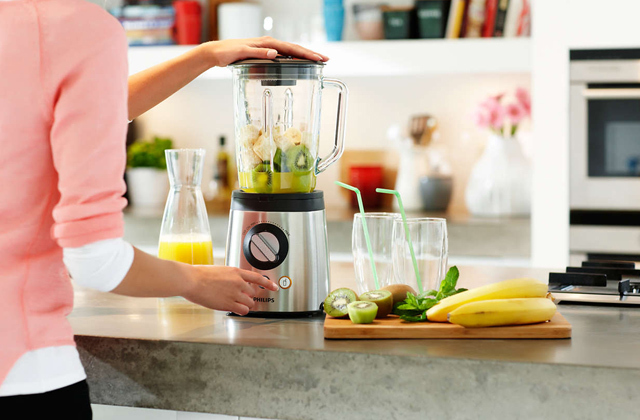 The model's wide neck opening makes it easy to add ice and fruit as well as simply refill your favourite drinks whenever necessary. The high-quality glass doesn’t take on residual odours, tastes, or stains from food and drinks. Plus, the glass looks polished and refined. Not recommended for fizzy drinks. 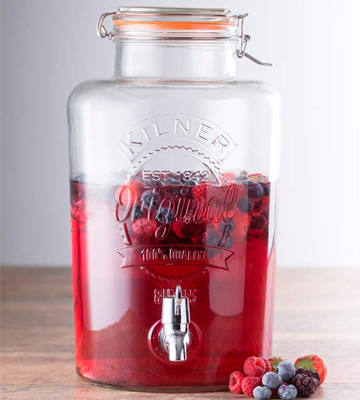 This model from Kilner looks a little better than your average drink dispenser. Its 8-litre capacity gives you more volume to work with, great for summer parties and garden get-togethers. The dispenser is practical and there's hardly anything we would like to change here. 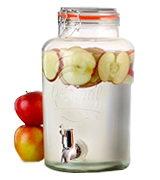 The jar features 2 mesh filters on the spigot. 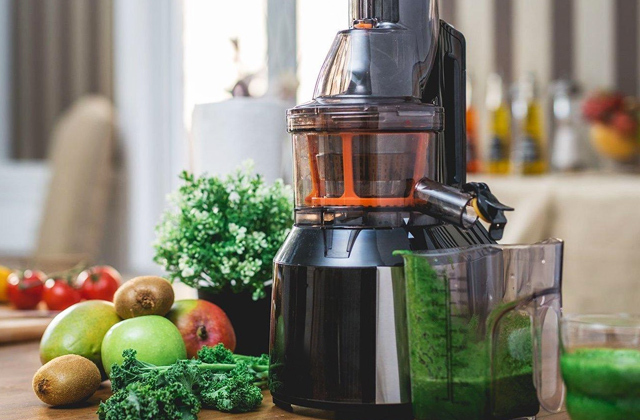 You won't have to deal with any clogging scenarios when pouring juice, just remove one of the filters and wash it under tap water. The jar comes with a gift tag that makes it a charming and personal gift. The metal clip is susceptible to deformation. 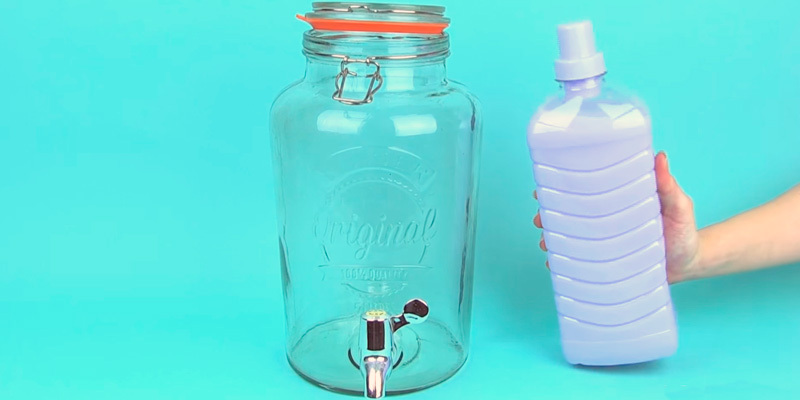 Smith's Mason Jars Drinks Dispenser presents a slightly different take on the usual formula. It gives you just about every single convenience that you'll find in similar dispensers but a slight change here and a different approach there make the product noticeable better than your average dispenser. 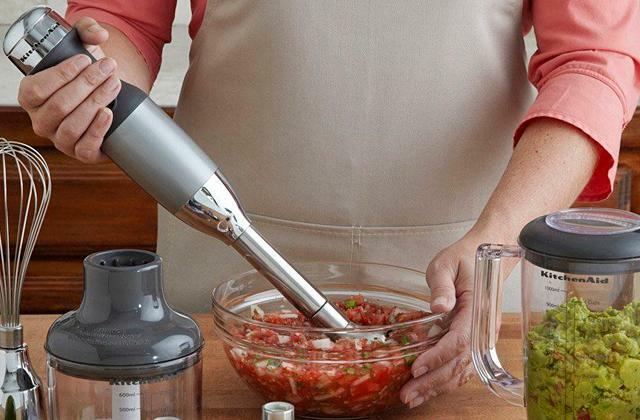 The smooth bottom, paired with the model's modest size, means you can always place the jar in the fridge. The soda-lime glass doesn't care about temperature changes, so you can use it outside when it is way below 0 degrees Celcius there. Due to the smooth bottom, we would recommend placing a cloth under the dispenser. 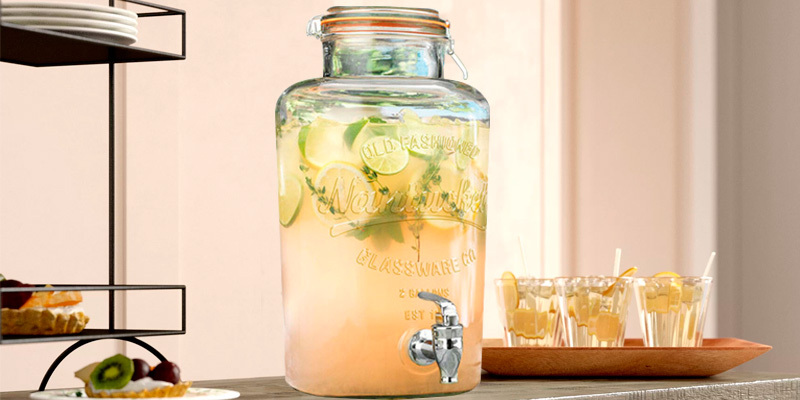 Kilner Garden Party Beverage Dispenser is definitely more about aesthetics than it is about practicality. That said, the model doesn't really disappoint in that department either. Its well-thought-out design makes it perfect for small parties in any weather. The neck opening is wider than average, making it easier to clean and maintain the dispenser. 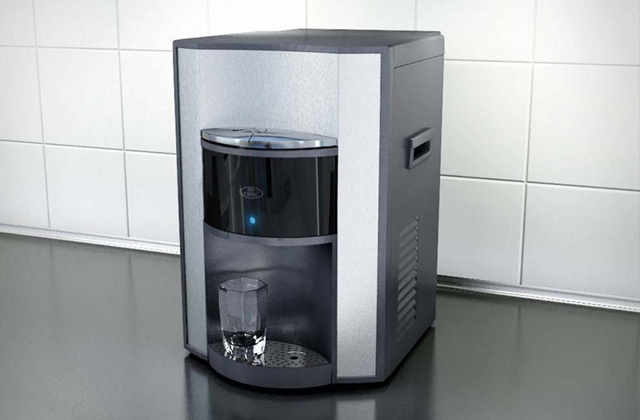 Its 8-litre capacity means that you'll have to waste less time refilling the dispenser. The Nantucket design gives it a homey feeling. The spigot doesn't always last long. 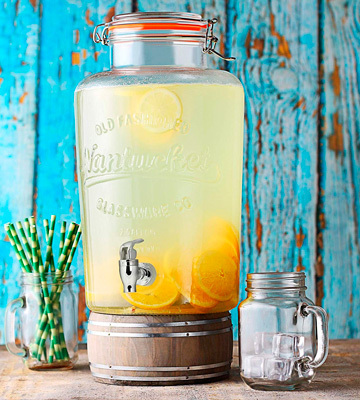 This is a great drink dispenser for crowded parties. A metal clip on the lid with its orange silicone seal will keep the drinks nice and fresh. With this dispenser, you will be able to entertain more guests without having to serve them drinks yourself every 5 minutes. The dispenser features 3 separate containers, so you can have 3 different drinks available at all times. Every tier has an individual anti-drip chrome plated tap, meaning 3 people could be using it simultaneously without really inconveniencing each other. There's a 1.7-litre ice compartment in the base. The lid doesn't have a silicone seal. This model from VonShef won't just help you entertain and charm your guests. 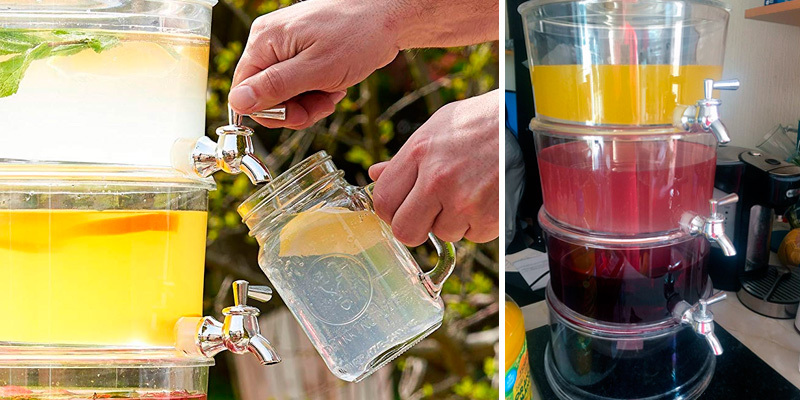 No, with this 3-tier drink dispenser, you'll have the means to throw an ace party. Different people have different tastes and preferences and this dispenser will help you satisfy them all. We don't necessarily like to play judge, jury, and executioner but, as far as we're concerned, this not-so-little jar from Kilner is probably one of the best drink dispensers out there and certainly the best model here. First, sticking with that original Kilsner design, the dispenser looks great, refined and polished but not too sophisticated and chic, so it won't cast the wrong impression. It will impress guests and serve as an excellent conversation starter without making you look pretentious. But, more importantly, the model will prove particularly functional and practical. We don't recommend it for fizzy drinks but, other than that, there are practically no limitations here. 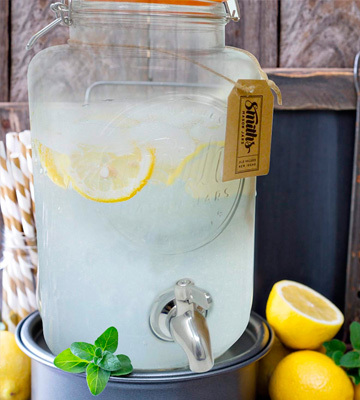 With its 8-litre capacity, this drink dispenser will prove a perfect summer party thirst quencher, doesn't matter how many guests you invite. 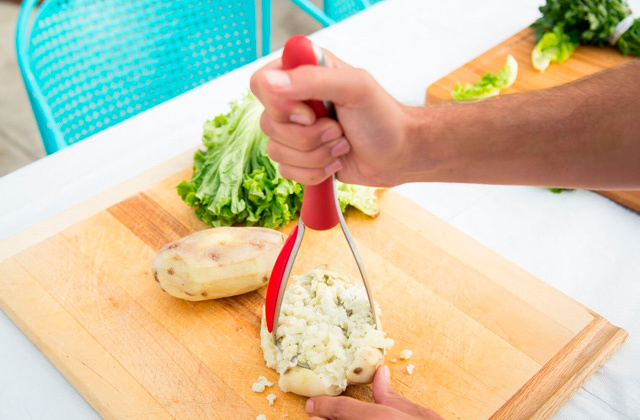 Plus, the easy-to-use spigot that works both as a stopper and pourer means your guests will be able to help themselves and you won't have to play bartender. The lid comes with a silicone seal and a nice little metal clip, perfect for keeping the different alcohol drinks' taste and aroma intact as well as keeping the insects out. 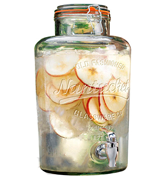 Bottom line, this model from Kilner looks a little better than your average drink dispenser. Its 8-litre capacity gives you more volume to work with, great for summer parties and garden get-togethers. The dispenser is practical and there's hardly anything we would like to change here. Your friends will have always a cool drink in hand. 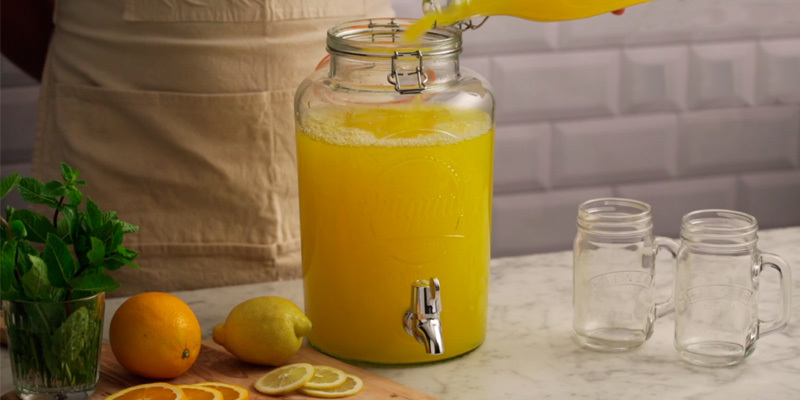 Smith's Mason Jars Drinks Dispenser is everything it promises to be - a nice big mason jar that will allow you to serve beverages to your guests. 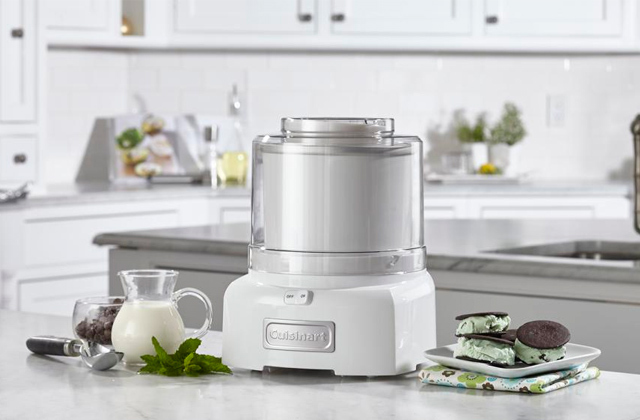 Of course, that doesn't sound like anything necessarily different from any other beverage dispenser but there's a thing or two here that make the product a little better than its competition. The biggest thing is definitely the removable wire mesh with 2 mesh filters on the spigot. 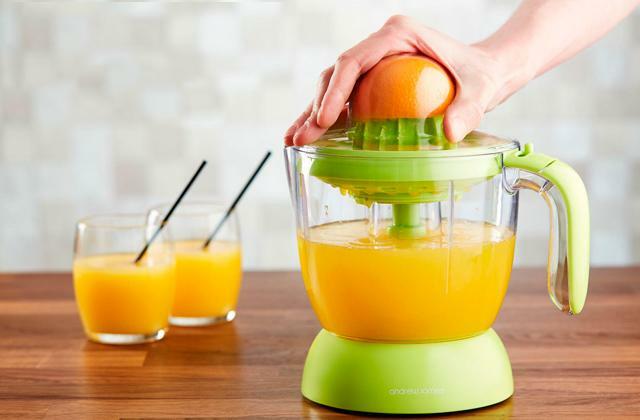 This means that you won't get any clogging when you use juices and other similar chunky drinks. 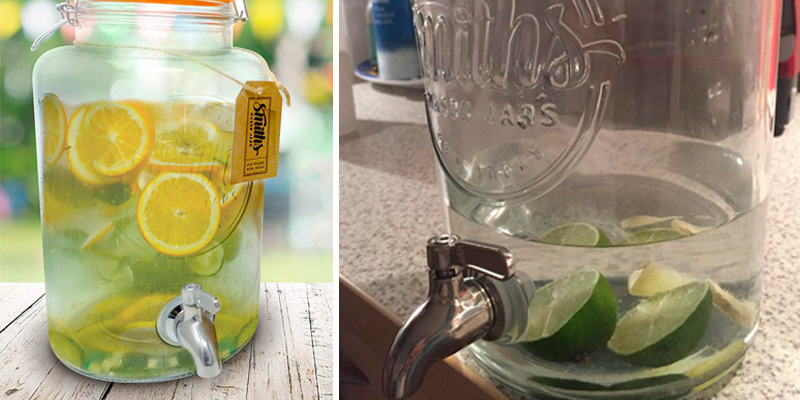 Just remove one of the filters, wash it under tap water, and you're good to go. The glass looks elegant enough to add to just about any event's aesthetics. Its a small thing but what we really like here is the gift tag that the dispenser comes supplied with. The model is already an excellent gift and a tag like that makes it all the more charming and personal. 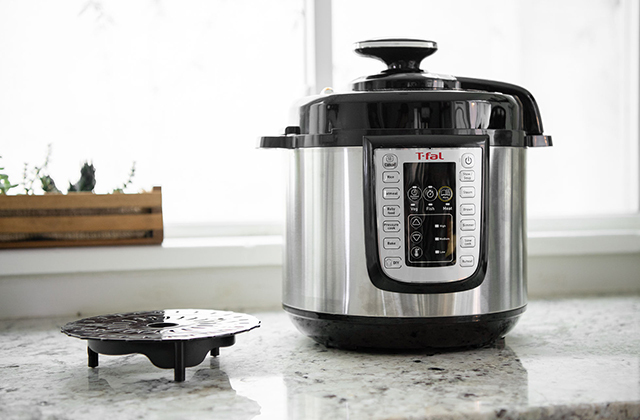 The last detail that separates this product from its inferior counterparts is the stainless steel spigot. Sure, you'll likely notice no differences but, as you'd imagine, a spigot like that is a lot more durable and reliable than your average plastic faucet. 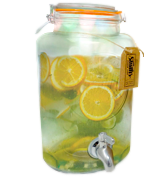 Simply put, Smith's Mason Jars Drinks Dispenser presents a slightly different take on the usual formula. It gives you just about every single convenience that you'll find in similar dispensers but a slight change here and a different approach there make the product noticeable better than your average dispenser. 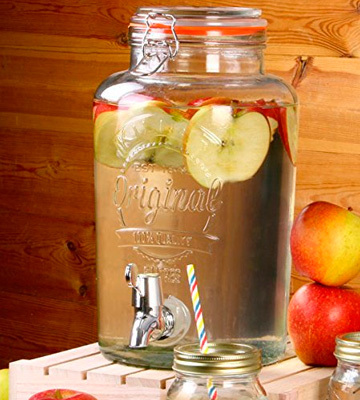 If vintage aesthetics are your thing, you definitely can't go wrong with Kilner Garden Party Beverage Dispenser. As you can probably tell from the pictures, the model rocks that old-school look with mid-century charm and functionality to match. That being said, we can't say that this is necessarily the most practical dispenser on the market today. It isn't really a downside per se but the model's volume is just 5 litres, so you won't be able to entertain a huge party with many guests. But, again, that's not really a downside, just something that the model isn't designed for in the first place. For example, it makes the dispenser perfect for picnics. What is a downside, however, is its smooth bottom. It's a small thing but we highly recommend placing a piece of cloth under it. Otherwise, it might shake and wobble a little. Apart from that, we don't really have any issues with this dispenser. The aforementioned bottom, paired with the model's modest size (25.4 x 18.3 x 31.5 centimetres in overall dimensions), means you can always place the jar in the fridge. The soda-lime glass is another thing that really sells this product. First, it doesn't care about temperature changes, so you can just as well use it outside when it is way below 0 degrees Celcius there. Second, it does not retain stains and odours. 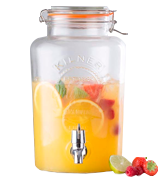 In short, Kilner Garden Party Beverage Dispenser is definitely more about aesthetics than it is about practicality. That said, the model doesn't really disappoint in that department either. Its well-thought-out design makes it perfect for small parties in any weather. To start with, Get Goods Drinks Dispenser incorporates that Nantucket design that so many people love in their household articles. But, as far as we're concerned, it really isn't about the model's appearance and more about what it can do for you. Because, in drink dispenser terms, it is a lot. For one thing, its volume stands at 8 litres. Needless to say, that's a lot and perfect for different social gatherings with many invitees. Plus, because of its well-thought-out design that doesn't incorporate anything redundant or unnecessary, the whole thing measures 28 x 21 x 36 centimetres in overall dimensions, which isn't a lot considering the aforementioned volume. Now, unfortunately, that "well-thought-out design" part doesn't extend to the spigot. It isn't bad per se, just that its plastic composition doesn't make this little component all too durable. However, it does extend to the neck opening. Wider than average, the opening makes it easier to pour the drinks in the jar and to stuff the fruits there. What's more, a wide neck opening like that also makes it easier to clean and maintain the dispenser. Add to that the metal clip on the lid with its orange silicone seal and you have an excellent drink dispenser. 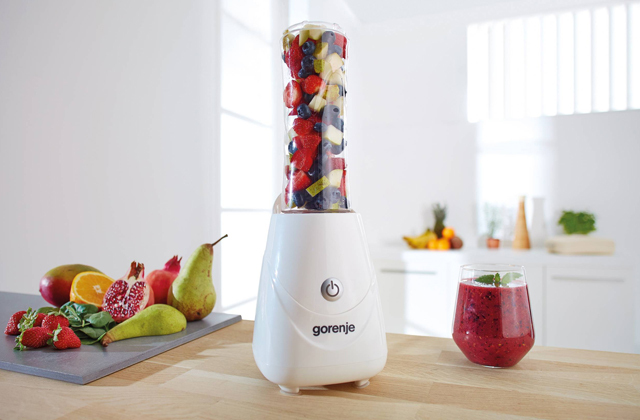 With it, you'll be able to entertain more guests without having to serve them drinks yourself every 5 minutes. 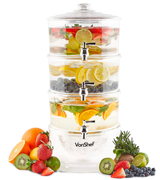 One look at this dispenser from VonShef and you can clearly tell that this product is very different compared to your average drink dispenser and every other model on this list. Instead of 1 large jar, this model incorporates a stackable design with 3 separate containers. As far as we can tell, the advantages here are obvious. First and foremost, you won't have to stick with a single drink, which is a good thing because, needless to say, different people have different tastes and preferences. 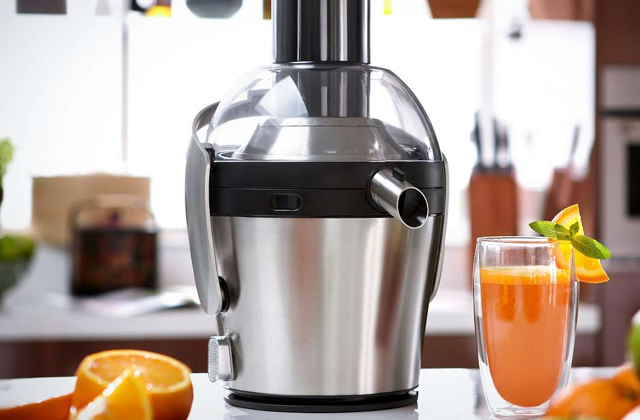 You can use it for a variety of drinks, including but not limited to fruit juice, cocktails, punch, beer, spirits, wine, just about any cold drink or soft drink. You can have 3 different drinks ready to be poured at all times, so you'll definitely be able to satisfy more guests. Furthermore, every tier here comes with an individual anti-drip chrome plated tap, meaning 3 people could be using it at the same time without really inconveniencing each other. On top of everything else (well, literally speaking, below everything else), the model features a 1.7-litre ice compartment in the base. Always having ice at hand is not a bad thing, we can probably agree here. Plus, it gives the whole thing a stable foundation, minimising the fall risks. In other words, this model from VonShef won't just help you entertain and charm your guests. 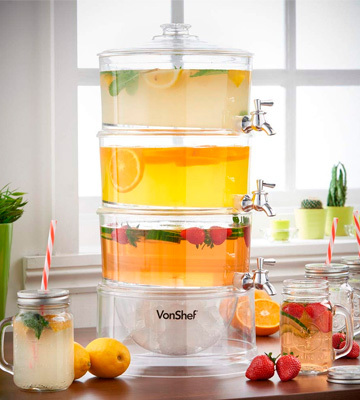 No, with this 3-tier drink dispenser, you can throw an ace party. Different people have different tastes and preferences and this dispenser will help you satisfy them all. Of course, the design makes it more of a tabletop model and not necessarily suitable for picnics but that's hardly something to complain about. What Is a Drink Dispenser? What's a drink dispenser? Well, it's all in the name, isn't it? You can call it beverage dispenser or anything along these lines but it doesn't really change things. In essence, a dispenser like that is any container (usually glass but sometimes a plastic jar) that comes equipped with a spigot and a lid. A container like that will prove a perfect addition to any social gathering. 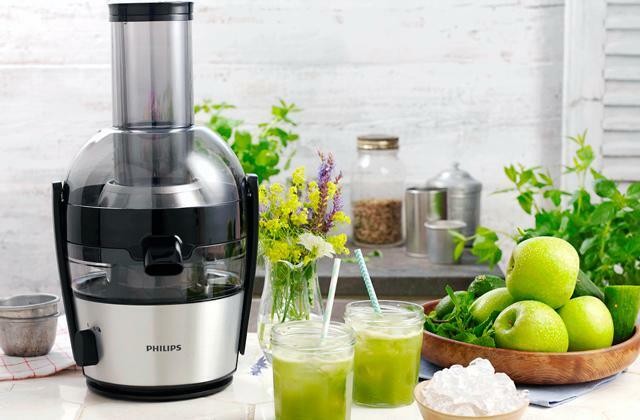 With it, you'll be able to serve different beverages to your guests, from alcohol drinks to lemonade, all without having to pour in each glass the old, inconvenient way. All you have to do is fill up the dispenser before or at the beginning of that social gathering, sit back, and relax. 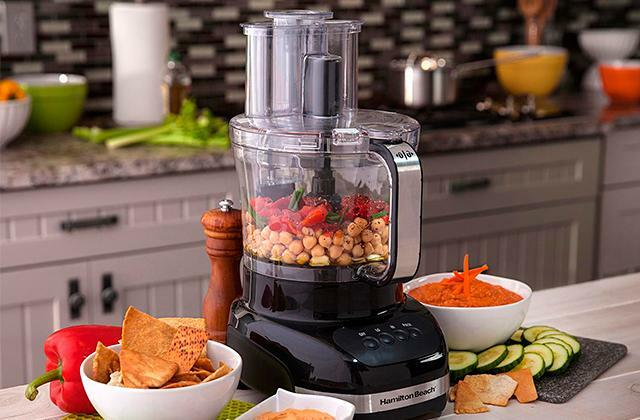 For our taste, every dispenser in this review is great but each model is suitable for slightly different needs and preferences, so make sure to keep yours in mind before you settle on the dispenser. For example, consider the materials that went into the model's construction because those will determine the longevity and, in part, overall convenience of the dispenser. Other than that, the size and volume always play a part in these things, so we don't have to tell you to consider those as well. A beverage refrigerator goes well with a drink dispenser. In there, you'll be able to keep a sizable drink collection. You can also consider a beer fridge as those are usually a little bit more compact.